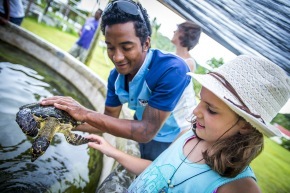 Enjoy a truly unique Fiji experience in the remote northern islands with unparalleled adventure and unforgettable scenery. Explore the beauty of Fiji aboard this small ship cruise, designed to offer you an authentic and personal view of the South Pacific. Captain Cook Cruises specializes in small ship adventures which give you the space to savor this amazing location, without large crowds of tourists. Tour stately 19th Century buildings and waterfront promenades in a time capsule of colonial rule. Visit Savusavu’s extinct volcanic crater, hot springs and thriving markets. Then it’s off to Bouma Waterfall National Park on the garden island of Taveuni for a chance to view or hike a series of natural waterfalls, swim in the Bouma Waterfall Lagoon and stand on the 180th Meridian – the arbitrary dateline between today and tomorrow. 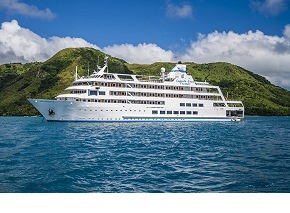 Your ship, the MV Reef Endeavour has 63 recently refurbished Tabue Suites, Staterooms and cabins. Every cabin type features a private bathroom, air conditioning, hair dryer, 240v power, Pure Fiji soaps and shampoos and daily towel service. 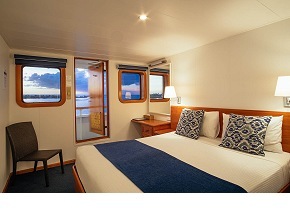 Staterooms and Suites open onto the outside deck and have two windows. Tabue Suites feature a bedroom (with bathroom) and a separate Day Room with chair, settee, desk, TV/DVD player, refrigerator, coffee/tea maker and a second bathroom. This special Three Nights Free offer is good on 7 and 11 night cruises and is only available until March 31, 2018. This cruise-only package is based on double accommodations. Single supplement and airfare rates available upon request, just inquire. Cruise rates include the Fiji Government’s Value Added Tax of 9%, Sales Turnover Tax of 6% and 10% Environmental and Climate Adaptation Levy which are subject to change without notice.